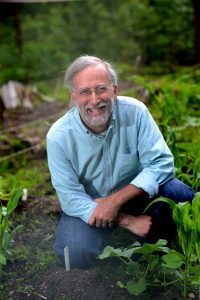 Gary Oppenheimer, AmpleHarvest.org Founder and CEO. I’m the first to admit that I’m an aging geek. I’m a pretty good gardener. I’m socially responsible and hate waste. At first glance you might think that these three things have little in common but in reality, it turns out that geeks are good at solving some problems, gardeners are good at creating some problems (food waste) and social responsibility creates an ideal nexus of the first two. Ten years ago today, I had an idea borne out of the frustration of growing too much food in my garden and struggling to find a place to donate the excess to and realized that “my” problem wasn’t mine alone. 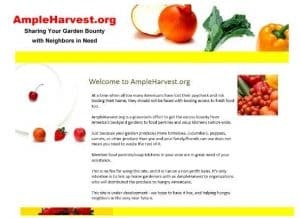 In late 2008, I uttered the phrase “Ample Harvest” for the first time ever while meeting with the gardeners at a local community garden but it was upon waking on March 19 that I decided to see if the domain “AmpleHarvest.org” was available (it was!). $9 and it was mine. As someone who hates waste (food, time, energy, and of course money), I couldn’t stop there – I had to do something with it. Over the next four hours, a vision of what is today AmpleHarvest.org came to me. My idea crystalized in the form of a series of PowerPoint slides that ended up outlining a solution” A nationwide answer to food waste and hunger. The message of “sharing your garden bounty with neighbors in need”, the grower and pantry pages, the menu structure, and even the awareness that this could not only help the gardeners no longer waste food, but also that it could help hungry families find a food pantry – all came to light that morning. I had no idea of the size of the problem, the likelihood that any food pantries or gardeners would even want in, what I would do with it, or if it would actually solve anyone’s problem but the more I looked at it, the more I realized that this was something that needed to be launched and tested. March 19, 2009, I woke up with an idea. A few weeks later, I shared it with America. Early on, a New Jersey state official suggested that I “test” this locally first, and then if it worked, try other states. I remember telling him that New Jersey and New Mexico had the exact same problem and that AmpleHarvest.org would give them both (and the other 48 states too), the exact same solution. In short, this was going to be a nationwide program sustainable and permanently solving a nationwide problem. No one had ever attempted to solve a hunger problem by moving information instead of moving food, and certainly, no one had ever tried to use technology to address the issue – food waste – that most people had not yet heard about. AmpleHarvest.org started traveling down the road never before traveled, and in short order, thousands of food pantries and millions of gardeners came along too. Food pantries and local gardeners connected by AmpleHarvest.org work to end food waste and hunger. Today, March 19, 2019, I’m looking at a nationwide nonprofit that’s helping millions of gardeners learn that they can donate their excess bounty to more than 8,400 food pantries. I’m also looking back with some amazement and certainly an awful lot of gratitude to two volunteers who helped create the first web site, food bank partners, the government, bloggers, the media, foundations and funders and especially to those closest to me – all of whom have played a critical part of turning a crystalized idea into a gem of a reality. That New Jersey official, as it turns out, was looking at the wrong problem. AmpleHarvest.org works amazingly well. What he didn’t mention and what I never envisioned, was how hard it would be to raise money to solve a problem that most people had never thought about, using a solution that none had ever thought of. March 19, 2009 started like most other days but it ended with a germ of an idea that would empower 42 million American’s to reach into their backyards to help their neighbors in need. AmpleHarvest.org was conceived ten years ago today and was born eight weeks later. Along with that was the start of a groundswell opportunity to change the future of the nation. More to follow on May 18!